It's been something like 5 years since Mark Millar's second coming comic Chosen originally came out but I guess the reason it's finally being collected now is that Millar plans on releasing a sequel soon to what he is now calling the American Jesus trilogy. And like a lot of Millar stuff since Wanted, it's been optioned by Hollywood. 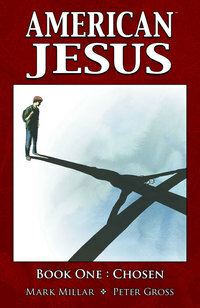 This first volume American Jesus introduces us to a twelve year old boy in the mid-1980's who discovers that he has Christ-like powers, which is a pretty heavy thing for a kid to deal with. If that doesn't sound like the cynical Mark Millar who once had Captain America kick a man while he was down, well, stick with it - there's a twist. 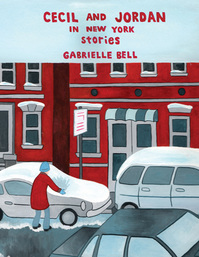 Indie comics creator Gabrielle Bell is best known for her autobiographical graphic novel Lucky which told her true life experiences of being a starving artist in Brooklyn. This new collection of short stories shows the more surreal side of Bell's work such as the title story which is about a young woman who turns into a chair so that she won't bother others around her. Bell is actually collaborating with visionary director Michel Gondry (Eternal Sunshine of the Spotless Mind) to adapt this story into a short film called Interior Design. Cecil and Jordan and the other stories collected here all appeared previously in anthologies such as MOME and Kramer's Ergot. While writer Ed Brubaker garners a lot of attention for his creator owned books Criminal and Incognito and his recent Marvel books Uncanny X-men and Immortal Iron Fist, he's been quietly racking up a solid run on Daredevil picking up where longtime writer Brian Michael Bendis left off a few years back. Brubaker has had Daredevil facing such classic enemies as Mister Fear and The Enforcers but in this volume he introduces a brand new villain. Well, sort of brand new. Actually, a female version of Daredevil arch-enemy Bullseye. 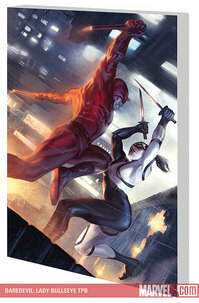 This new Lady Bullseye combines all the things Daredevil fans love - martial arts, the Yakuza and the Hand. Yeah, that's right, that says 856 pages. That's a lot of comic right there. But even more noteworthy than the length is that this a NEW work from Yoshihiro Tatsumi, the famed godfather of gekiga, a term he used to describe his more adult-oritented, alternative style of manga. Tatsumi's work grew in popularity in Japan in the 1960s but has only recently been published in the U.S. thanks to a series of hardcover reprints starting with The Push Man And Other Stories which was fostered by American indie cartoonist Adrian Tomine. 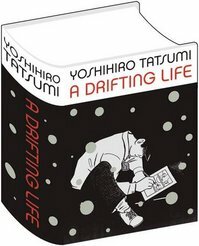 A Drifting Life is Tatsumi's autobiography telling of his life as an artist in post -WWII Japan. It's a behemoth of a read but will likely reveal some insightful details on not only the birth of the gekiga movement but on life in this period in Japan's history as well. 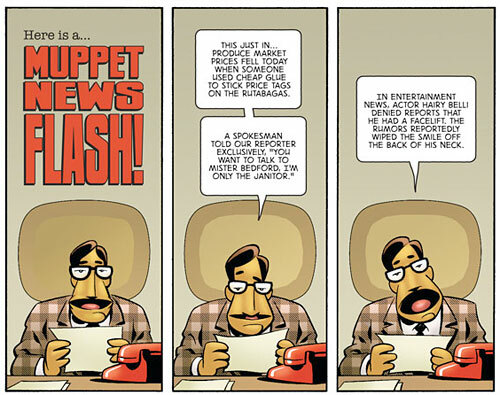 In one of the most perfect pairings of artist and content since Michelangelo depicted the birth of man, Roger Langridge adapts The Muppet Show into a four issue mini-series from Boom! Studios. Langridge is best known for his own creation, Fred The Clown. He is a master at absurd and slapstick humor and brings his sensibilities to the Muppets while perfectly retaining everything we used to love about the classic TV show. 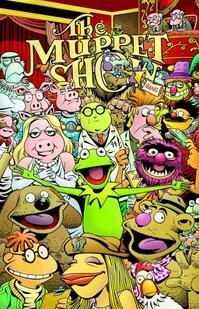 Amidst the various comedy skits performed in-comic for the show, the story involves the muppets trying to cheer up Kermit the Frog who seems to be in a bit of a funk. Check out this great looking preview. Ambush Bug fans will rejoice at this phonebook size collection of his classic exploits. Collecting McKeever's 12 issue series about an apocalyptic battle between angels and demons. The latest installment of DC's plan to reel in the Watchmen movie audience to check out other sophisticated fare from the catalog. Next up, a reprint of Warren Ellis' classic sci-fi, pulp X-Files series, Planetary. Another special set in Alan Moore's superhero/cop show universe but sans-Moore. Zander Cannon writes with Chinese artist Da Xiong providing the art.